With our newest family member arriving in August, it's time to get serious about nursery planning! Prior to having children I was always like "Why can't people get their nurseries done before baby arrives? You've got 9 months people." Oh, naive non-mother Michelle. What I didn't realize is that you feel like garbage the first 3 months. You spend the next 3 months getting your life back in order. Then you're like "HOLY COW. A baby is arriving in 3 months." The latter is where we're currently at. I had high hopes of being almost done with the nursery by now but babies have a way of showing you who is boss even before they arrive. I've had to move much slower this pregnancy than I did with Clark. I don't exactly handle moving slowly well but it's at least given me time to really think about the nursery plan. My former craft room is being converted into the nursery. 1. Am I keeping the chevron? 2. Are you sad to see your craft room go? 1. Nope. I'm over the chevron. Good-bye. 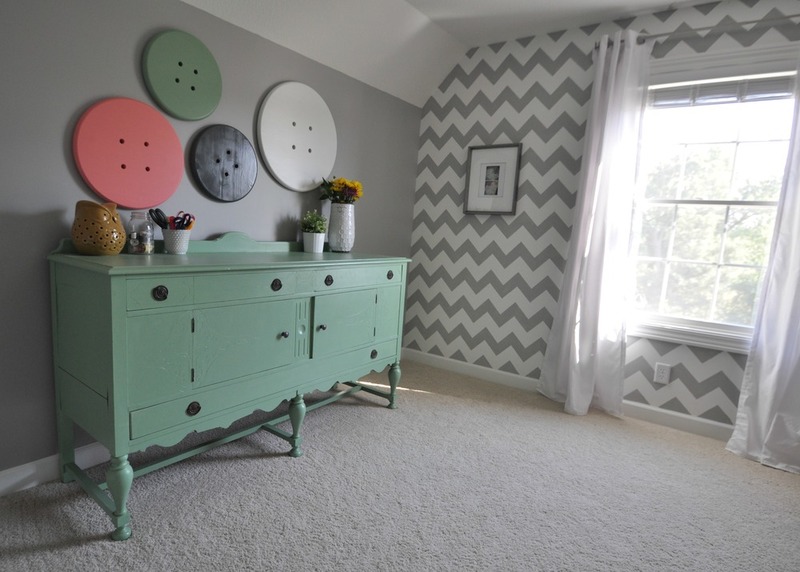 Interestingly enough we started repainting this room 5 years to the day that I started stenciling the chevron wall. It had a good run. It really would be easier to just plop a crib and dresser in here but you all know I can't do that. I must make things a challenge! 2. Honestly, I'm so excited for this baby and let's be real, my crafting time is limited these days. The only thing I was sad to see go was the green buffet but my brother adopted it which helped ease my pain! I'm still debating keeping the button art above the crib (firmly secured, of course). I packed up the items that I actually use and they are being stored in our basement guest closet. I donated the rest. It was nice to go through this room with a purpose and free myself of the items I will never use. The walls that were formerly grey have now been painted Privilege Green by Sherwin Williams. The ottoman will be paired with a rocker. I think we've settled on this one from Amazon. We are debating between quality furniture and IKEA for the dresser. We have really been focused on purchasing higher quality items but I think IKEA is going to win. Because children. I'm still working on the finer details (where I always struggle). I have purchased this stupid cute rabbit print and fun wooden camera. I still need crib sheets and a changing pad cover. More art work. Shelving. You know, necessities for a baby. We'll be transitioning Clark (see his nursery here and here) to a twin bed and the baby will get his crib. Wish us luck on that transition! Nate and I are both motivated to get this going before July so I'll keep you updated!